Apple Watch is my primary smartwatch for now. It looks amazing, yet I could not shake the fear of accidentally breaking it during my everyday activities. I started my quest to find the ideal protection for this useful gadget months ago, ended up purchasing some cases and finally found the one I am comfortable with. First, the screen. Apple Watch’s screen is curved, so ordinary plastic-based screen protection will not work for 2 reasons: they require flat surface and a screen not so tiny. After long search, my choice went to Belkin ScreenForce InvisiGlass. As the name suggest, this thing is tempered glass. To my surprise, apparently this screen protector does not protect the entire surface of Apple Watch screen. Instead, it covers the middle part that happens to be flat. I was a bit disappointed, but after actually putting the protector, I am happy with the clarity. So the screen protector stays on. With only the middle part of my screen having protection, I needed something to protect the curve surface. My first choice went to some non-branded cases I could easily get from eBay. Sadly, they are all crap. Believe me you don’t want to spend a lot of money for a beautiful piece of device only to be covered by something ugly. 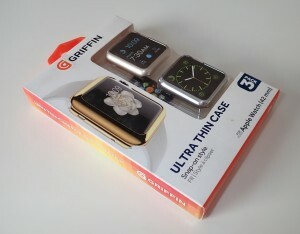 After a few failed purchases, I got myself Griffin Ultra Thin Case for Apple Watch. This is an interesting product because we get 3 cases. I got the combination colors of silver, matte gold and clear. These watch cases look amazing and I quickly loved the clear one as soon as I put it on. One of the feature they put in the product description is “no need to remove your watchband”. I did not realise that it is also its main weakness. Why? This case quickly snap on the watch. That is cool. But it also means that it easily snap off. I lost it twice during the first week of wearing, lucky I lost it near home and managed to find it back. The third time I realised it was gone, I couldn’t even track back when did I lose it. So I lost my first case in less than 3 weeks. Back then I realised why they give us 3 cases instead of 1. The second case (the shiny silver) was not lost. It was broken when my 3 yo son tried to grab my hand and accidentally grabbed on my watch instead. It was just a light grab and I was quite surprised that it got the case broken. The third one (matte gold) survived around 4 weeks. After losing the other 2 cases, I took very good care of the case and frequently checked if I still have it. One fateful day I lost it anyway. 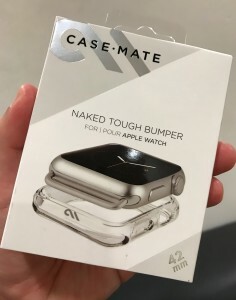 My next choice of case went to Case-Mate Naked Touch Bumper. The most useful feature is that this case is NOT a snap on. It needs us to take off the watch bands to put on. So it will not get lost easily. It looks good and the clear colour shows the watch’s original color. This is the case I still use until today and I have used it for more than 6 weeks. My son had accidentally grabbed it a few times and it stays there. Excellent case that actually looks nice.